Anchorage, Alaska - Former Alaska Republican Rep. Vic Kohring was convicted Thursday of of conspiracy, attempted extortion and bribery. 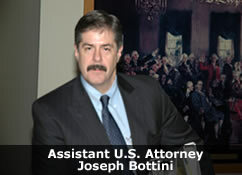 Kohring escaped conviction on a single count of extortion. Federal prosecutors are 3-0 for convictions against crooked Republicans in Alaska's Legislature. Kohring never testified in his own defense and was portrayed by prosecutors as a manipulative politician who wasn't shy when it came to asking for money from VECO. "It's a result that I'm going to just have to live with. That is life, and as I said yesterday and the day before and the day before that, it's not the end of my life and I'm very excited about the future, I've got a lot of good opportunities awaiting me." Vic Kohring said after the verdict. 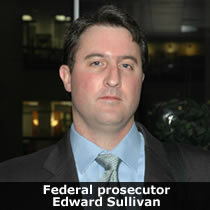 Federal prosecutor Edward Sullivan (Pictured right) accused Kohring of demanding and receiving cash and favors from VECO executives in exchange for his support on legislative actions. Former Alaska Republican Rep. Vic Kohring was convicted Thursday of of conspiracy, attempted extortion and bribery. Kohring escaped conviction on a single count of extortion. Videos secretly recorded by the FBI in Juneau's Baranof Hotel showed Kohring accepting piles of $100 bills from VECO's Bill Allen and Rick Smith during the 2006 legislative session. VECO was a corrupt oil services company run by convicted criminals Allen and Smith who took marching orders from oil companies in Alaska. Allen was a long-time supporter of Republicans in Alaska before being convicted last May of bribery; conspiracy to commit bribery, extortion under color of official right, and honest services mail and wire fraud; and conspiracy to defraud the Internal Revenue Service of the U.S. Department of Treasury. "Although it is a sad day for Alaska, I applaud the jury for providing a just verdict. Public trust and integrity are the foundation of good government. Mr. Kohring clearly violated those tenets. He not only betrayed the trust of those who elected him, but the trust of those closest to him. This reaffirms my commitment to conduct the people's business in an open and transparent fashion."